Since that first taste of this delicious pork dish I’ve reduced my meat intake significantly, making the meat the focus of a meal just once a week. I thought long and hard about choosing a meat dish to cook this week, then the fruity aroma of pineapple from the display in my fruit shop clinched the deal. You need just one half of a pineapple for this recipe and if like me you like a bite of acidity, choose one that is a little under ripe. Roasting the fruit intensifies the flavour and sweetness. There are a few steps involved in the preparation but it’s not at all complicated. Once the pineapple is roasted, the meat marinating and the sauce reducing on the stove top, all that remains is a quick stir fry before it is ready to serve. Simply put it’s subtly spiced stir fried pork, charred roasted fresh pineapple and a piquant sauce. The flavours were irresistibly good. I have a penchant for putting my mark on recipes, making adjustment as I go. This delicious dish was well and truly inspired by Melbourne based blogger Josephine @ “Burp! Appetite” who posts Asian style recipes that are suitable for my quirky diet. She uses ingredients that are fresh appealing and tasty. Josephine understands flavour! 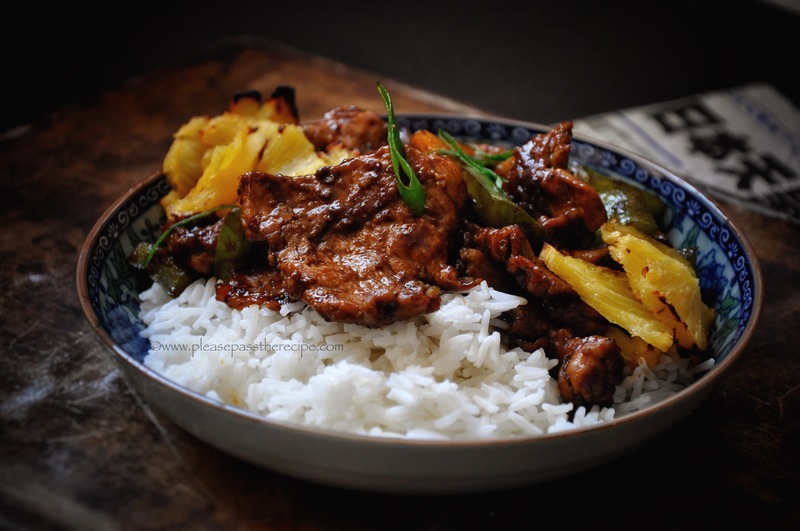 If you too have horrible memories of fatty pork with canned pineapple in a sweet sauce passed off as sweet and sour, I urge you to try this recipe, you’ll be pleased you did. 1 green pepper cut into 3cm squares. Preheat the oven to 220C and line a tray with baking paper. Peel the pineapple and discard the skin. Remove the eyes then thinly slice the fruit. Cut each slice into 5-6 pieces then remove the core and set it aside for the sauce. Arrange the pineapple pieces on the oven tray then bake until it’s beginning to char on the edges, about 20 minutes. Remove from the oven and set aside. Put all the sauce ingredients plus the pineapple trimming into a small saucepan. Heat, stirring constantly until the sugar is dissolved. Bring the sauce to the boil then reduce the heat and simmer until the sauce has reduced by half. Strain and keep warm. Toss the sliced pork in the cornflour using your finger to massage it through and separate the slices. Add the marinade and again, thoroughly massage it through. Rest the marinating pork in the fridge until you’re ready to cook. Heat a wok until smoking then add a little oil. Stir fry the pork in small batches and set aside. Add the green pepper to the hot wok and stir fry for a couple of minutes. Return the pork to the wok, moisten with a little sauce then bring to the boil. Serve immediately garnished with the charred pineapple pieces. Pass the sauce at the table. This dish is delicious with steamed rice and a side salad of Asian coleslaw. Great ‘new school’ sweet and sour Sandra. We came across a very old school Chinese restaurant recently that could have been lifted from the 1970’s. The sweet and sour (I didn’t order it) was the kind that makes you avoid anything with pineapple in it but this, this is something else. Roasting the pineapple, hello! Seems a bit of a no brainer really, but I guess I had felt no desire to look at Sweet and Sour closely enough to consider improving it’s image until I cooked this that is…. Delicious! And how fun to find the essence of something that has generally been ruined. Absolutely, I wonder if this was how it all began…..
Definitely some fantastic flavour combinations to try out here. I must get to the Farmer’s market on Wednesday for some free range pork and just-picked pineapple! Good luck at the market Kate and I hope you enjoy the recipe as much as we did..
Definitely bookmarking this one, it sounds so good! A very sophisticated sweet and sour, enjoy…. This I have to try! Not much resemblance to the old sweet-and-sour 🙂 ! Unusual marinade promising a treat! And way-back-when I remember the pineapple coming out of tins even in restaurants . . . For me the only watching-point would be to make sure that there was but a tad of char on the pineapple as any browning is so carcinogenic . . . This reset my opinion about the pork/pineapple/vinegar combination, it really is delicious if handled with care. No need to char the pineapple at all Eha, just bake it until it’s dried out a little, the flavour becomes really intense. Very nice styling Sandra, love that Chinese newspaper in the background. Thanks. I squirreled away some packaging from an online purchase, knew it had a use. I have pineapple sliced and ready to use and pork in the freezer so it will be no problem making this and the flavors are calling to me at the moment. This looks and is so impressive. Thanks for sharing! I love the flavours of sweet and sour pork, and you are right, those horrible takeaways and pre-made meals available in the supermarket do not do it justice. I’ve found Chinese ingredients here in Athens, so it looks like a good one to try. i have added it to my recipe list, Sandra. I also have shuddering memories of that sweet and sour, so this sounds delicious. Sounds fabulous, Sandra. I have just spent the entire afternoon making gluten free shortcrust pastry so that I could make your ‘Blue Cheese, Fennel and Pepper Quiche’. It is 37 here at the moment 😥 but the quiche has just come out of the oven and looks promising… will let you know. Will have to recover before trying this dish, but it does sound like something we would love. Thank you! This entry was posted on January 19, 2017 by ladyredspecs in Cooking, FODMAP diet, Food, Gluten Free, Main Meals, Pork and veal, recipes and tagged Fodmap, pineapple, pork, sweet and sour.